Continuing on with my series of blogs on “quirky” museums, there is one such museum that was unfortunately closed on the day I went to visit. I wish I had researched their open times better when planning my trip to the Baltic Sea. Alas, I will need to travel there again someday, but at least I was able to get pictures through the windows, and their website contains a wealth of information about them. 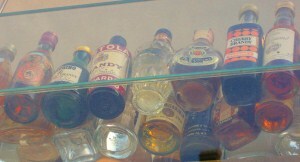 At approximately 1.7 ounces of liquid per mini bottle (at least that is what you are served on an airplane), that would be a total of 90,100 ounces of something to drink in these bottles in this gallery. That is equivalent to 11,263 cups or 704 gallons! (The accountant in me had to figure this out.) Now that’s a lot of bottles, and a lot of liquid! And, I’m pretty sure that drinking from any of these bottles is not allowed. The gallery can even help you out with finding entertainment for your soiree, such as clowns or comedians, and even DJ’s and live bands and dancing. And it looks like they even assist with the invitations, and serve all kinds of tasty-looking food. 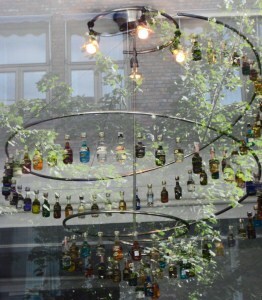 Christian Ringnes Jr., also known as “The Mini Bottle King,” is the founder of this gallery/museum/fun place. When he was 7 years old, Christian’s father gave him a “half-empty” bottle as a gift. (For positivity, I’d rather say a “half-full” bottle.) 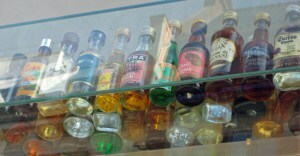 It was then that Christian began collecting the miniature bottles that would someday become the center of his fine establishment. Christian’s great-great-grandfather also influenced his interest in bottles, as he was the one who founded the honored Ringnes Brewery in 1877, which is now part of the Danish brewing giant Carlsberg. I have several questions about this place that I would ask during my future visit. Is there only alcohol in all those bottles, or is there some other kind of beverage? Does Oslo have earthquakes, and if so, are all the bottles somehow secured down? 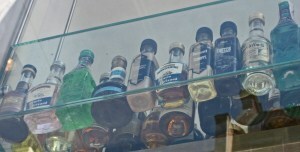 And, why are most of the bottles in the Mini Bottle Gallery in a strictly monitored vault? This entry was posted in Baltic Sea & Countries, Europe, Scandinavia and tagged Baltic Sea, Norway, Scandinavia by debbysdepartures. Bookmark the permalink. Funny comment, sis! Made me laugh. But…are you referring to the bottles or to your daughter/my niece? Hope when you get there, it is open!